After initially releasing in 1995, Jumanji returned again in 2017 with the reboot, Jumanji: Welcome to the Jungle. On the back of that popularity, NetEnt acquired the rights to the series in order to develop a branded game with the 2018 Jumanji slot. NetEnt has crafted the Jumanji slot with a board game style that is closer in tone to the original movie. What’s also interesting is that NetEnt has shaken up the design by creating Jumanji with a varied number of rows over the five reels and 36 paylines. The first and fifth reels are entirely normal in that there are three rows. However, there are four rows on the second and fourth reels, while the middle reel even has five rows. 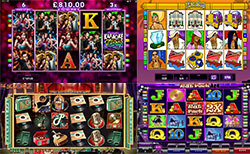 Even still, it is possible for the slot to be compatible on desktop and mobile at NetEnt casino sites. Moving on to the wagering, players have to start by assigning a coin value that falls within the range of €0.01 to €2.00. Of course, a betting level of one to 10 must also be chosen. Therefore, the possible bets can span from €0.10 up to €200.00. • Sticky Vines: when activated, all winning symbols and wilds are held in place for another spin of the reels. • Monsoon Wilds: a random feature that can cause either one or two reels to be completely stacked with wild symbols. • Monkey Mayhem: randomly triggered and follows a win, causing for all symbols to be shifted around for another win guaranteed. • Wild Stampede: rhinos stamped across the screen to leave behind another four to nine wild symbols. • Board Game: users can actually play the Jumanji board game with three or more scatters. The rewards include Vines Free Spins, Monsoon Free Spins, Monkey Free Spins, Stampede Free Spins, extra rolls, coin wins, or a mystery feature. Jumanji has been incredibly designed and there is so much to enjoy about the experience. From the innovative reels and 36 paylines to the sheer variety of fun features and the board game bonus round, Jumanji manages to blur the lines between a video slot and a video game.